High-level tools for working with 'data.world' data sets. 'data.world' is a platform where you can find interesting data, store and showcase your own data and data projects, and find and collaborate with other members. In addition to exploring, querying and charting data on the data.world site, you can access data via 'API' endpoints and integrations. Use this package to access, query and explore data sets, and to publish your insights. Visit < https://data.world>, for additional information. The data.world package is the main R package for working with datasets on data.world. To get started, load the library and checkout the quickstart vignette. 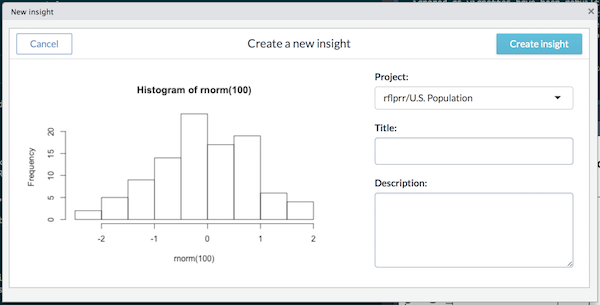 For your convenience, this package allows you to publish insights to data projects without leaving R Studio. Using R Studio's "Addins" menu, look for DATA.WORLD > New insight. The add-in will automatically capture the active plot in R Studio's plot view and give you the opportunity to quickly choose the project, and enter title and description for your insight. IMPORTANT: For your security, do not include your API authentication token in code that is intended to be shared with others. Config files are the most convenient configuration method. Once saved configuration will be automatically restored when data.world is loaded. Check out the quickstart and query vignette and the package documentation (?data.world).